The Last of Us being my absolute favorite game (along with it's DLC Left Behind) ain't any news. 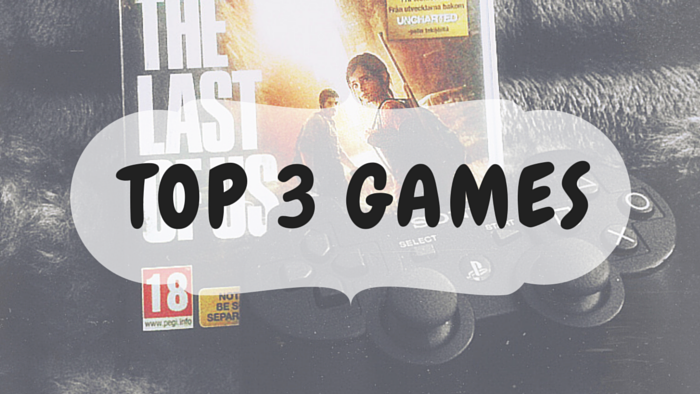 But I haven't talked that much about gaming here yet so thought I would start by sharing my Top 3 Games! Like I said The Last of Us is my favorite. Close second to that one is The Evil Within which is by Bethesda who have also made my 3rd favorite which is Fallout 3. All my love for Naughty Dog who made The Last of us but Bethesda is the one who has most games I've enjoyed. It was actually hard picking the 3rd one but Fallout 3 is the game that got me really into gaming so it will probably always be on the list. And stating the obvious; I prefer horror games. What are you Top 3 Games? My boyfriend loves The Last of Us. I'm more into Nintendo games! I love Fallout :) I'm so excited for Fallout 4 at the end of the year! Me too! I've only gamed 3 and New Vegas but love it! :) Omg I know, can't wait to get my hands on Fallout 4!! I don't play games myself, but I would not let my husband play The Last of Us when I wasn't around because I was so obsessed with the story. I haven't let him play the side quest yet because I'm still emotionally recovering from the main game!